Asthma Canada is committed to improving the lives of the Canadian asthma community through education and support services, research and advocacy. This year, we are offering a series of five free online webinars to educate and raise awareness for people affected by asthma. Our Speaker Series Webinars will address key topics and issues that the asthma community is facing. Our first webinar is the Paradoxes of Asthma Management, which will be held on Thursday, April 5 at 12:00 pm (EDT). Despite advancements in asthma treatment, asthma rates have not decreased. There exists a disconnect between feeling that one is in control of their asthma and the actual severity of the symptoms currently experienced as measured by objective tests. Many people living with asthma actually think their asthma is under control when, in reality, it is not! Additionally, the over-reliance on blue reliever inhalers to provide quick relief of asthma symptoms rather than the long-term prevention provided by controllers is a paradox in asthma management that needs to be addressed. Our webinars include a Question & Answer session with the guest speaker, giving you the opportunity to ask your most pressing questions to one of Canada’s leaders in allergy research. Don’t miss out! The guest for our first Speaker Series Webinar is Dr. Anne Ellis. Dr. Anne K. Ellis is a Professor in the Department of Medicine with a cross-appointment to the Department of Biomedical and Molecular Sciences at Queen’s University. Her position is one of a Clinician Scientist with 70% protected time for research. 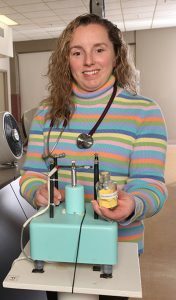 She has served as the Chair of the Division of Allergy & Immunology since May 2010, and is the Director of the Allergy Research Unit of Kingston General Hospital; the flagship of this research program being the Environmental Exposure Unit (EEU), an internationally recognized and validated controlled allergen challenge model of allergic rhinitis. She is also involved in clinical trials of novel therapies for asthma, and has studied the safety of novel immunotherapies in patients with asthma.